The red-breasted sapsucker is distinctive with its all-red head and breast. Its back and wings are mostly black with small yellow spots and a large white wing stripe. It gets to 22 cm long. This bird can be found in moist coastal forests, mostly at low and middle elevations, from southern Alaska (in summer) to northern Mexico (in winter). It is present on the BC coast year-round. See range map. Juvenile red-breasted sapsuckers, which have dark brown heads, could be confused with the brown-headed female Williamson's sapsucker (Sphyrapicus thyroideus). The latter has a heavily barred back as opposed to the sparsely spotted black back of the red-breasted sapsucker. 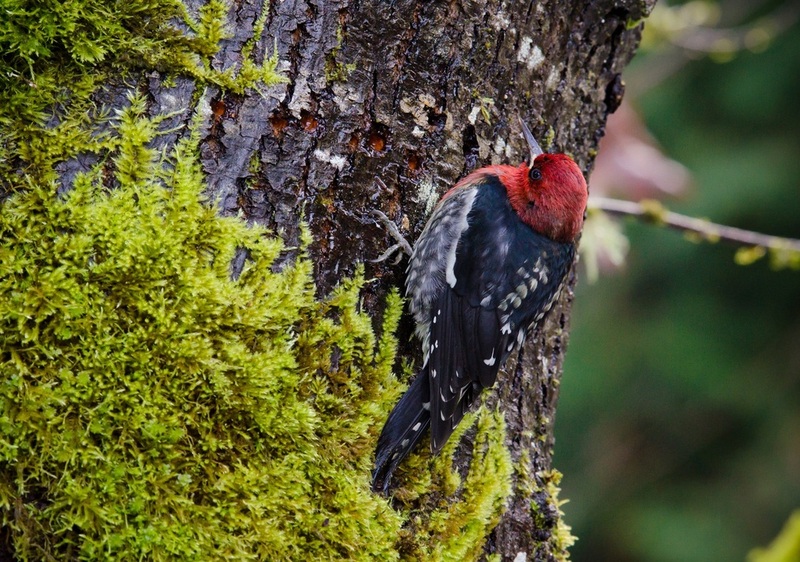 The red-breasted sapsucker was once grouped as a single species with the yellow-bellied sapuscker (S. varius) and the red-naped sapsucker (S. nuchalis), neither of which are found regularly on the BC coast. Dunn, J. L. and Alderfer, J. (Eds.). (1999). National Geographic Field Guide to the Birds of North America. (3rd Ed.). Washington, D.C.: National Geographic Society. Pp. 278-279. Red-breasted Sapsucker. The Birds of North America Online (A. Poole, Ed.). Ithaca: Cornell Lab of Ornithology. Retrieved from the Birds of North America Online. Accessed 10/12/2014. Red-breasted Sapsucker Sphyrapicus ruber. Audubon birds. National Audubon Society. Accessed 09/12/2014.